The documentary was aired in S. Korea the week of February 19, 2012 and people involved with making were pleased with out come. I received my copies the second week of March 2012. I was very excited to watch it. I was curious as to what made the final cut and what did not. There was a lot of filming done and in the end maybe a third of it made it into the documentary. Upon watching the film there was a lot of dubbing done to the English interviews. I had though they would keep our parts English with Korean subtitles. Perhaps that would of been to much for the Korean viewers. Just as they had planned there were four themes that my personal life including family and friends, my professional life including my work at HAWC and my motivational speaking, Tae Kwon Do accomplishments, and my trip to South Korea which were put into five episodes. I now have my own theme music which is pretty cool! I was amused to see that they kept me being annoyed with them at dinner one night. I looked at the camera a told him I was tired, sore, hungry, and cranky and I would talk to him later. Then there was a conversation with nephew when we were trying to get him to tell his name to the camera and he says he was busy. Very cute I was happy to see that made the film that was so him and he was so cute. I was really please to see that Shriners Hospital for Children was captured in a really good light as they have always been an important part of my life. Watching myself in this film and others has really given me a new perspective on how I do things and why people are sometimes amazing by what I do. I have been slowly sharing the film with friends and family. I have a friend making some copies for me so I can lend them out. He is also trying to take out the dubbing into Korean of the English interviews to allow my friends and family to be able to understand. Just the other night I had a movie with a bunch of and one of friends who speaks Korean came over to translate some of the Korean. This was a lot of I finally got to understand what was being said by people in the Korean episode after I spoke or demonstrated my Tae Kwon Do. It turns out people were inspired by me! As I get better with video editing I hope to put parts of it on my website or youtube. 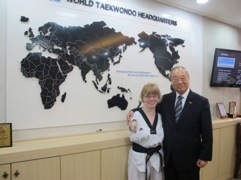 Day two we returned to Kukkiwon and I had the pleasure to meet with the president. He gave me a Letter of Commendation. In recognition of my outstanding contribution to the development and dissemination of Taekwondo. We then visited the open area that the testing took place in the day before and did a bit of filming. I had to do a little self advocacy with the filming crew as they wanted me walk around and then stand still for about ten minutes. After talking with then they understood why that was not going to happen. 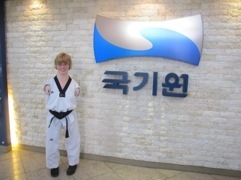 We then left to go to a local Tae Kwon Do school and spent the rest of the day there. I was barely in the door and I was asked to speak. I introduced myself and said hello and then took a minute to set down my jacket. Then I spoke a bit on my life and Tae Kwon Do. The school had a demonstration planed for me and so I was able to sit an watch them. They did forms, breaking, and sparring. 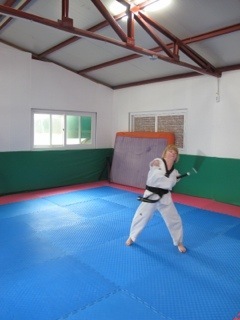 Then I was asked to do some Tae Kwon Do and I did some kicking drills, breaking, nun-chucks and sparred with them. Later we some lunch ad talked . Some of the students tried to teach me some Korean and tried to teach them some English. There was some interviewing of the the Master, students and myself. There was also a reporter and camera from a local T.V. Station who wanted to capture the day with me. There was a second class that I joined and that class was for students with disabilities. I joined the class as they were doing a basic class form that I was able to learned quickly and it was lot of fun. After the class some of the parents arrived and I performed my nun chucks. The day was lot of fun by the end I was very tired, sore and hungry. That evening we had plans to eat Korean Barbecue at a local restaurant. By the time we got there I was very hungry and cranky. The film crew was taking forever to get going and it was cold outside. I went into the restaurant trying to get them moving along but that did not work. Then needed the coming and going. I went back outside annoyed and then back in hoping to eat soon. Next thing I know the camera is in my face again asking me what I thought of the place. I said it was nice. I was then asked is that all you have to say. I responded I am sore, tired, cranky, and hungry I will talk to you more after I eat. I bet that will make the film. Dinner was quick to arrive and I was given kimchi (Korean cabbage) I quickly put it aside knowing that I did not like it as I had tried it the day before. It was quickly questioned why I was not eating it and I explained that I did not like and therefore was not eating it. They did not seem to like that but did not push anymore. Momo was able to meet us for dinner which was great! Then we finished up our dinner and went back to the hotel. All and all dinner was really nice. On the third and finally day we started the day with a visit to the Tae Kwon Do Promotion Federation. This was the group that funded the first documentary that I was a part in. There was a short business meeting and during that I was asked to write a short message to the Korean people. I was then asked to be a speaker at this summers International Tae Kwon Do camp which I accepted. We then got to see a short video about the Tae Kwon Do Park that is being built. It was a great meeting they gifted me some really nice things. That afternoon we did some sightseeing. We tried to go to the palace but found out it was closed on Tuesdays. However, we did get to look around the front part of grounds and take some pictures. 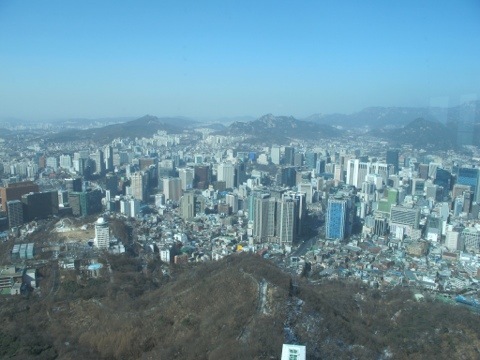 Then we went to the highest point in Seoul and got to see the whole city it was beautiful. There I learned about the locks of love. People come to this place lock the locks to the fence and write messages to there love ones. I left a lock for my family. 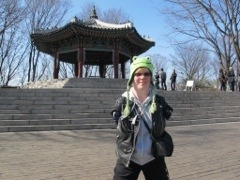 Later we went to the largest out door market in Seoul. I was looking forward to getting a necklace for myself. The market place was a lot of fun and bit cold. Later in the day I meet up with a reporter from a Tae Kwon Do newspaper and did a short interview. Before dinner there was the last formal interview in my room. This was an opportunity for the film crew to ask or follow up on last minute things. At first it was a short laid back interview. Quickly it became formal. They wanted me to sit here instead of there. They wanted me to sit this way instead of that way. It was frustrating because they wanted to sit in a way that was not comfortable for my body. I went with it because I knew it was important. There was one thing that I was not going to deal with and that them physically moving me around without being asked. My chair was being moved and then my body without words well without English words. At last I said to the producer if you want me to move would please ask me in English and I would be happy to do that. He then talk me the camera guy does not speak English how can you ask that. I looked at the producer and said I know he does not speak English I am asking you to speak English not him. He went silent a few minutes later he he asked me to move to the right. I looked at him and said thank you that was all that I was looking for. We then finished up and went to dinner. My last night we went to a nice restaurant. One of the interesting things I found to happen while eating in Korea was that you did not order individual dishes. It seemed that things came as an appetizer would here and then everyone ate from everything. We ordered pizza that was very different. No sauce and it was on a very different kind of dough, but it was good. Dinner was nice and there was no filming! After dinner I meet up with Momo for drinks and dessert. It was nice to meet up with as I spent a lot of time with him while he was filming me in the US. Momo walked me back to the hotel and wished me good flight home. I went up to the room to pack up. As I packed I was having a hard time fitting everything in the suitcase as I was gifted a number of things over the last three days. The following morning we went to the airport. I was was flying home on my know because Andrew had business and was staying. The flight home was just as nice as it was going there as I was on the same two story plane. Our flight home was a bit shorter 12 hours instead of 15. Unfortunately, it felt way longer probably because I slept less then the flight over. Before I knew it we were landing at JFK airport and then it was a short flight home to Boston. I did have a few hours in JFK before boarding for Boston. Once through customs I texted home and got my messages from my family. My sister Lisa and I talked for awhile about my trip and all the things going on while I was gone. I had a great trip but it great to be home! When I look back I’m glad that I did it. There are some things I wish went differently. I wish there was more interpreting there for me. It seemed that there was interpreting only when when I directly needed to be spoken to. I realize this was probably because I was being filmed but it was frustrating for me. I understood hello, thank you and Sheila that is very little. The worst part was hearing my name all the time and not understanding what was being said. I spent my childhood with people whispering things about me and even though this was not the same it brought back some of those memories. I was there three days and going crazy not understanding things I have a new respect for people coming to the US without the language or the culture. I wish I had had a friend with me. Andrew was there as an agent and made sure that things went smoothly but it would of been more fun to share this whole experience with a friend or family member. The documentary will be out soon. I’ll keep you posted. The US Filming finished mid-day on January 31, 2012 which meant I had two and a half days to make sure all my responsibilities at work were organized and to get myself packed before I left from S. Korea. At 5:30 on Thursday night I shut down my computer and looked to my friend Erin and said “I’m going to S.Korea tomorrow, Wow”. It just hit me mainly because I was so focused on making sure things were organized at work. I went home to finish packing and go to bed early. I had to be up at 3:00 am to catch my shuttle to the airport to make my 6 am flight to JFK, New York. I flew Korean Airs in the largest plane I had even seen it was two stories referred to as the airbus. We had coach tickets and they were nicer then I expected. I had an individual tv to watch what I liked when I liked. They also gave out little bags with slippers, toothpaste and a toothbrush. I have to say I have never been feed some much on a plane and the food was pretty good too. The flight was way to long 15 hours on a plane I read, watched movies, listened to music, slept a few different times, played video game and had time to spare. By the time we landed I was so done with the plane and happy to be on land. My legs were a bit sore and swollen despite my efforts to walk around on the plane and feet barely fit in my shoes. I was happy that I had a wheelchair reserved. As we existed the plane the reality that I had traveled half way around the world set in. There was little to no English written or heard around me we were brought to get our luggage and then to customs I was completely lost. We existed customs and were meet by the Korean filming crew. After 15 hours on a plane I was sore and a little disoriented and now I was on film again. They wanted my impressions on Korea I did not have much to say as I had only had seen the airport. We had about a 45 minute ride to Hotel M where we were staying. Seoul is a pretty modern city lots of people, businesses, buildings, and traffic as with most cities no parking. The hotel I stayed at was very nice. You had a little walk in area where one would take off their shoes and put on the provided slippers. The floor was heated! Then you had your usually hotel amenities. Now the bathroom setup was a bit different. There were different slippers to change into when going in there. Took a little bit to figure out because everything was written in characters. The shower stall drain out on the floor instead of a self contained space. This I figured out after soaking two towels as I usually leave things on the floor. I later realized this is a typical setup it just goes to show you the small culture differences. I made it to 9 pm on my first night and feel fast asleep. My first full day was scheduled tightly. 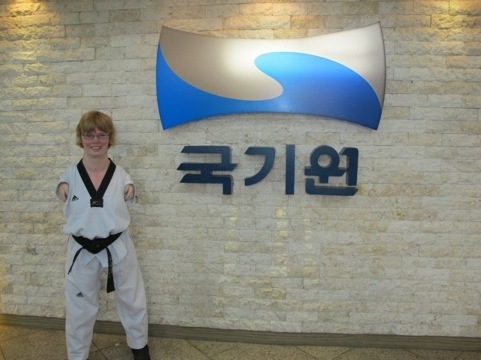 First stop was Kukkiwon, the headquarters of Tae Kwon Do, I had been told they were having an event that day and I was invited. It was not until that morning did I realize that this event was the weekly testing that occurred for students in Seoul. Students did not get tested at the local but came here. The place was packed three was an easy three to five hundred people there. When we first arrived we meet with a number of the Masters and then I interacted with some of the students. Students lined the hallways practicing and the testing space was was huge. During the meeting I realized they wanted me to do forms out in the testing space the idea was a bit scary. I was fine with it but told them I need a little practice time before hand. Before I knew it I was changing into my Do-Bulk (uniform) in order to perform my hyung (form). I had sometime to practice in the hallway which was great as I was nervous. As I was trying to practice the camera was staring back at me and I told him he needed to leave. I needed to get centered and having a camera in my face was not working for me. He understood and let me be asking if he could film practicing in a little bit and I agreed. I agreed but the practicing only lasted a few more minutes and I was called to the floor. Since I know little to no Korean and an interpreter was not brought to the floor there was a lot of gesturing to get me to the floor. Once there I waited my turn to be brought forward. There were many people there and three ring setup to accommodate all the testing so lots of activity. When I was brought forward things were brought to a stop. A man introduced me , at least I assume he did as it was all in Korean, then I heard charyot (attention), kyung-nae (bow), jhoon-bee (ready) and she-jae (start). Thank you Bruce McCorry’s Martial Arts for teaching me these important Korean words. It all went fast as forms do not take very long. I was presented with a new uniform and another blackbelt. When I was done I thanked the Masters. I then did some practicing in the hallway for camera. Then there was pictures with everyone. People were coming up to me left and right. It was a trip. We then went for lunch on the ground and I had my first Korean meal. It was pretty good except for the spicy cabbage which I later learned is what everyone eats there. I also impressed everyone as I used my chopsticks with lunch. Thank you Mr. K’s, Asian African Class. Then we went to a museum upstairs from where we ate. It was really interesting as it held all things Olympic Tae Kwon Do. 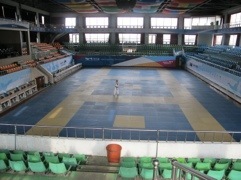 It also had pictures of a less modern Kukkiwon. Then we were off to our next scheduled event with the Scouts. 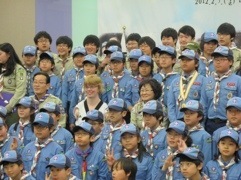 It was interesting to realize that there are boy scouts and girls scouts in Korea as I have always seen that as an American Association. That is probably more my assumptions then anything else as I do not know the history of the scouts and the world is a smaller place now. Why not have scouts all around the world. I was a part of the days event. It was great to speak to the scouts about my life regarding bullying and Tae Kwon Do. It was a fun full day and I was fast asleep by 9 pm. Today I got a little a down time which was needed. I had intended to do a training with Awareness and Action unfortunately I could get consent to have the filming with me advance and thought best not to go. I had given my consent to be apart of this and felt that I should not go places where I knew filming would not happen. Instead I kept my original day off and planned that we would do my formal interview that was needed anyways. I was happy to sleep in a bit and get rest as my knees where bothering me a bit. I ended up with the morning off as Momo was checking-in to things for filming for the evening. We all sat and had lunch and then there was setup for the interview. This took a fair amount of time and the location was chanced a few things before agreeing on the space. The most difficult thing about the interview was how they wanted me to sit. They were concerned about position and lighting I was concerned about comfort of my legs in particular which is something people do not always understand. The interview went well and then they filmed me reading which I thought was rather weird. Then I got the rest of the day to rest as they went to do the formal interview with Sandra and Master McCorry at Martial Arts. That evening I had plans to hangout with my friend Zayda from work. We planned to meet up at the mall an go on the Jumpy Thing in the center of the mall. I had wanted to do this for sometime but had not got around to do it. It took us a little while to locate the man at the jumpy thing and then got setup. I was nervous at first as I had never done this before and I do not have a great like for heights. I held on tight at first and slowly got more comfortable with it. I did a bunch of bouncing and jumpy no big tricks. I did have a great deal of fun. There was a bit of screaming at first thou that ended quickly. After that we got a drink an headed home. We had planned to make some brownies but ended up doing hair and makeup which was really fun. I can not remember the last time I had done hair and makeup with a friend. We giggled and laughed a great deal that night. Then I got my picture taken. I was told to pose and stuff which had in a fit of giggles because it felt very weird. Filming happen in the evening for me on this day. They had spent sometime filming the north shore because it was pretty warm that day. Also they were really not interested in filming any more meeting at work which was fine with me. I had a very important meeting at work that day and did not need the stress of the filming. At Tae Kwon Do that night there was to be an interview with one of the young students had been bullied at school. His mother was there as well and she was interviewed also. I did a small private with him going over forms, belt combinations and saw his new weapon he was learning. They leaned that he had some knowledge of chucks and wanted him to do the with me. This was uncomfortable on a few levels first I do chucks different then others and did not know if this would confuse him and second I realized he was just learning the chucks. Then there was the fact that he needed to get back to class. They had bee with him for sometime and it was important for him to rejoin class which he did. They then decided to interview his mom. This gave me a break. I have to say at this point the filming was getting to me. It had been a week and everyday they were there with the camera. They wanted to know what we were doing next or they were trying to interview my friends and family while in the middle of things. Everyone seemed ok with it but I felt uncomfortable for them. I still had a week to go. It was at this point i remember why I had originally agreed to seven to ten days not to fourteen. Fourteen it was going to be and I just reminded myself that this would make a difference for other people. The second class started an we broke up into groups. I was in the front part of the class with another teacher and we were working on forms with the students. This was a little nerve racking as do not usually lead a class and was getting the feeling that is what they wanted. I continued with want I usually do never the less. The next class was my usually class. They were very interested in me sparring and asked if we could do that tonight. I told them it was not up to me it was up to Sandra. As it turned out we were doing weapons and breaking that night which was fine with as I enjoy both of those things. They were excited to film both of these things. They also continued to randomly interview my friends in the middle of class which was a little uncomfortable. Class went well I did have a little trouble breaking the board with my hand but in the end I succeed. My hand hurt a bit and might have bruises in the morning but that was part of the process sometimes. I have been told that I’m really going to Korea. This is exciting! I really wish they would confirm some details. Filming today is Tae Kwon Do again. They are interviewing another student and then I will have my regular Wednesday night class. The interview went really well. I learned that she had been bullied at school as well and did not know that before. She also told me that when I presented at her school last year it really made a difference for her to know that I was bullied when I was a child and that she was not alone. After the interview we joined the stretch and then there was class for her. We did kicking drills during class and I went around helped with kicked and tried to keep the students focused. My regular class was next. I learned just before that we would be sparring tonight which made me very happy. Then I learned that they wanted my friends to to wear a camera on their heads when sparring. I did not like this idea. I told Master McCorry hoping he would tell them no but he said I needed to tell them if I felt uncomfortable about the idea. I tried to convince him that it was a bad idea. That did not work. Finally I told him that I would not ask my friends to do that it made me feel uncomfortable. I understood it would get better shoots with the camera but people were here to do class not to do things differently because of me. So he had to film with the other camera. Class was great because we were sparring and moving around quickly there was no time for questions/interviews of me or my friends. I was free to focus on Tae Kwon Do and I really needed it. Work had been very stressful and I was not getting my usually stress relief at Tae Kwon Do because of the camera being there. After sparing there was some questions but I was too tired to care. Today there were two things planned to be filmed today a presentation about HAWC at Endicott College and roller skating after work. I arrived a early for the presentation which is a norm for me. The filming guys were late and then I realized that I had given them the wrong address to the main entrance to the college. I started the presentation with a video and then went on to present. The filming arriving a few minutes into the video. The presentation went great I had candy and gifts to give out this made a good interaction between me and the group. I was throwing candy around the room without that much difficulty. After the presentation I had checked with the professor about and interview which he was agreeable to. Then all of a sudden he wants to film me driving on the campus. I understand the need to film the coming and going but he had ever asked this of me before when we planned the day. I needed to get back to work as I had many things to get done. He went without this filming as I went to work. I left feeling rushed that having the filming was keeping from doing my job properly, even thou it was not. Everyone was getting sick at work which caused only a few to be able to go roller skating. I was fine with it but they kept asking me were are your friends it was annoying even if it was not meant that way. As it turned out my sister, nephew, dad, and two friends were able to come. When we arrived there were more issues because the rink was in use for lessons already. We were able to made it work for about a half hour which was good for me as I had not roller skated for a while. While waiting to figure things out we come to realize my old roller skating teacher was there doing lessons, small world. It was a lot of. It was a lot harder then I remember. I skated around with everyone and was having fun. Then Momo put this camera on my head which messed me all up. I was thinking and feeling that and within seconds I was on the ground. I also feel to the side that the micro phone was so it hurt more then it should with the little box on my hip. While there they interviewed friends and family all the while this not so bad because they all were there for filming so it did not feel weird. Until they tried to interview my old teacher. He was teaching lessons that did not feel ok to me. He was ok with the request and declined. His wife was there and did remember me and was interviewed for a few minutes. They wanted me apart of it as well I last only a few and left my legs were tired and I needed to sit down now! After skating I decided to go to the grocery store to pick up a few things for my house party tomorrow. They seemed taken back by this expecting me to go tomorrow after work before the party. That seemed crazy to me because needed to be getting for the party at that point not going shopping. I ended up going shopping with Michelle because they really wanted to go with a friend. I guess it makes for better filming to have another with me. I think they thought I was going to prepare more for party. It was was a potluck this is how parties happen with us. I was a little stressed and grumpy with work so when asked about food I was quick that was not cooking. The shopping was fast. I am not sure if it was what he was looking for but did not really care.